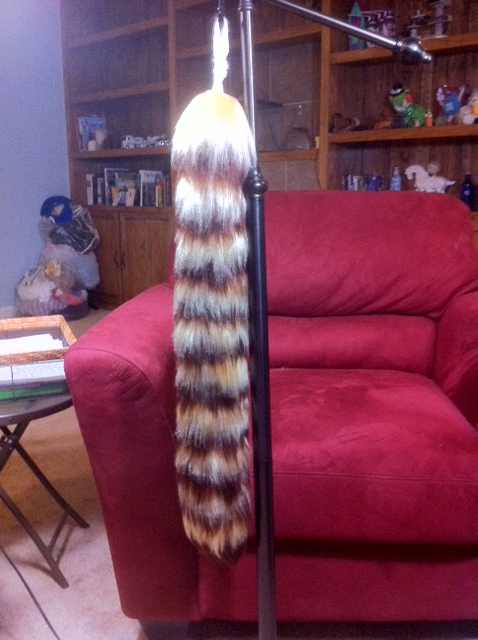 So, was bored a few months ago so Foxentine and I decided I should make a yarn tail. He brushed it out a lot and helped me cut everything and piece it together. It's at least 3 feet long and sways beautifully. I am rather proud of it. Was supposed to be just a random tabby cat tail but then Mari said it looked like Milsy's (my first ever 'sona who was a cream colored tanuki) tail. If anybody is interested in a yarn tail we are making big ones like this for $20-40 USD. Price depends on complexity and length desired. I will probably be making smaller ones like this for like $10-15.